The availability of digital tools has made it easier than ever to record and edit sound, and teachers of composition have noticed. We're entering an age of soundwriting, where the affordances of sound intersect the pedagogies and practices of writing and rhetoric. When we record, edit, and produce digital audio with our students, we see new ways of understanding many of the concerns of our field: genre, voice, identity, emotion, audience, space, and time. 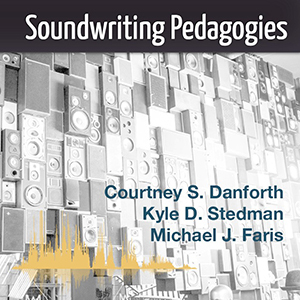 Soundwriting Pedagogies is a born-digital edited collection that explores innovative sound-based pedagogies and encourages readers/listeners to teach with sound in their own college-level rhetoric and writing courses. These chapters include both established and new voices from twenty-one writing and communication scholars in nine chapters and an introduction. Their work extends from deafness to noise, lexicology to listening, oral history to radio pedagogy, writing program administration, race, voice, and artist-mediums. Each chapter includes digital audio, and the book includes an audio playlist (with RSS feed for your preferred podcast app), etudes with downloadable interactive files, and rich transcription because soundwriting pedagogy should be accessible to all interested scholars. Soundwriting Pedagogies--replete with suggestions for teaching students to compose podcasts, immersive soundscapes, radio shows, historical revocalizations, and oral histories, while introducing them to critical reflections on race, noise, the ethics of voice, and disability--encourages readers to experiment with sound in teaching writing. Danforth, Courtney S., Kyle D. Stedman, and Michael J. Faris, editors. Soundwriting Pedagogies. Logan: Computers and Composition Digital P/Utah State UP, 2018, http://ccdigitalpress.org/soundwriting. Soundwriting Pedagogies by Courtney S. Danforth, Kyle D. Stedman, & Michael J. Faris is licensed under a Creative Commons Attribution-NonCommercial 4.0 International License, with the exception of chapter 6, "Sleight of Ear," whose authors retain their copyright.